A “no-deal” Brexit was always the only Brexit the UK had any chance to gain out of its fascist minded referendum. This is not just because the opponents of Brexit are in charge of the process, although they are; nor is it simply because the May government is incompetent, although it is. The real reason a “no-deal” Brexit was inevitable is that Britain is looking for the same sort of deal with the European Union that it enjoyed with India up until 1948. If Britain could dictate its relation with the EU and determine EU policies, its membership in the EU would not be a problem. The problem only emerges because the EU asserts in no uncertain terms that its rules apply to all members without exception. This is unacceptable to Britain — Brits are special and deserve special rules that apply only to them. Faced now with the prospects of a “no-deal” Brexit, the British establishment has collapsed into confusion. It appears there is no way out of its predicament, but this is not true. The British government need only borrow a couple of pages from its own history to resolve its current problems by adopting policies it first enacted in the 1800s: unilateral free trade and a sharp reduction in hours of labor. 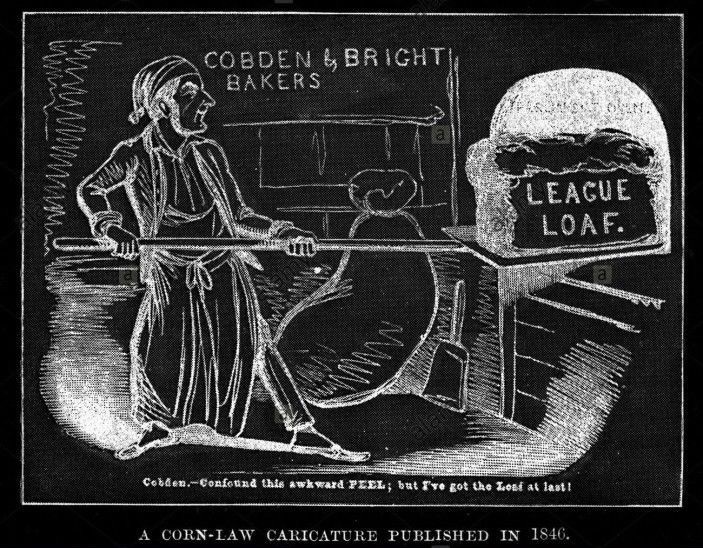 Free trade: Nearly everyone is familiar with the repeal of the Corn Laws in the mid-19th century. Yet few communists understand why this repeal worked for Britain and to the disadvantage of its competitors. Tariffs and other barriers to international trade raise the prices of commodities by relying on the output of less productive domestic firms. The difference between the prices of commodities in a protectionist regime and a free trade regime amount to a sort of rent made possible solely by the action of the state, but it also raises the so-called cost of labor power. If this protectionist action on the part of the state is removed, prices tend to fall, profit margins are squeezed, and a portion of the domestic firms will be forced to invest in improved methods of production or be driven into bankruptcy. As can be seen, free trade policy works by increasing pressure on capitalist firms (by reducing prices and, therefore, profits) to improve their methods of production, by squeezing more surplus value from wage workers in less time. This political tactic had far-reaching importance in securing Britain’s place as the undisputed world industrial leader. According to Marx, once limits were set on the length of hours of labor, capitalist firms were forced to introduce improved methods of production in order to squeeze more surplus value out of the working class in a shorter working day and raise the rate of profit. This had the effect of accelerating capitalist growth perhaps as much as five-fold in the following decades, as Marx details in chapter fifteen of Capital. As can be inferred from Marx’s labor theory of value, the two measures work in tandem to place unprecedented pressure on capitalist profits. By imposing a free trade regime on domestic prices, profit margins are severely squeezed — this is the hammer on capitalist profits. By reducing the working day in tandem with free trade, the capitalists are prevented from transferring the impact of this profit squeeze onto the working class through wage reductions and layoffs — this is the anvil. The result would be generally lower prices for commodities, more leisure time for the working class and higher wages, even as British industry is forced to become more competitive within the world market. And — oh — let’s not forget that the policies have the added effect that by generally reducing hours of labor, Britain’s contribution to global climate change would be greatly reduced as well. Postscript: The conservative rag, National Review, has rediscovered unilateral free trade as a solution to “no-deal” Brexit as well, but, of course, conveniently, they have managed to forget that free trade legislation was accompanied by a sharp reduction in hours of labor. Unfortunately, global warming is not a localized problem. Reducing hours of labor does nothing by itself because capitalist production is simply shifted to other parts of the world. It would have to be matched by a reduction in consumption. And it would have to be a global effort when it comes to GHG emissions because the atmosphere is shared globally. Of course, it’s not only emissions but capitalism’s direct destruction of terrestrial and oceanic environments that necessitate its immediate abolishment. Yes. This is why I was careful to specifically say that it would reduce >>Britain’s contribution<< to climate change. It wouldn’t reduce Britain’s contribution to climate change unless a reduction in hours translated to a reduction in consumption. Just because a nation shifts its production outside it’s borders doesn’t mean it’s not contributing to global climate change. It makes no sense to frame global problems like that. With what means would Britain pay for this increased consumption of imports, since (if all else is held to be constant) less labor implies they are also exporting less? I would assume the same way any country with a trade-deficit funds its consumption. We can observe the US-Asian trade relationship over the past thirty years as an example. If by holding everything else constant you mean no additional foreign investment, no change in deficit spending, etc., I would be curious how a capitalist country today could get to that state in the first place without a revolution. Perhaps it would help if you could explain how the UK might finance a deficit to sustain the sort of consumption you think might occur. As a net importer, it continues doing what it’s already doing. But it doesn’t matter if any particular country is a net importer or exporter in terms of the global impact. The problem is with the entire capitalist mode of production as it operates globally. If Britain were to reduce hours labour specifically to transition away from capitalism, not to increase competitiveness, great. The problem is with the idea that global warming can be addressed indirectly, worse still, through the capitalist, market-driven process. I know this is going to come as a shock to you, but Britain’s vendors only care that Britain can pay for what they import. They don’t care about capitalism, competitiveness, global warming or market driven processes. What they care about is cash. Britain raises this cash by exporting commodities. If they reduce hours of labor, they produce fewer commodities, or reduce the prices of the commodities they export. Either way, they can afford to import fewer commodities to make up for what they no longer produce. Do you have a solution to this problem? If they reduce hours of labour to shrink their capitalist economy, fine. If they do so to become the next Germany, then there is a problem unless somehow they figure out how to decouple growth from increased energy consumption. And, remember, it’s the entire commodity lifespan from production to consumption that matters. One of the problem with mainstream (and even heterodox) economics theories is exemplified in your statement. In the capitalist mode of production, production is the problem. Production always exceeds consumption. You have to target production, not consumption. Right — through a reduction in labour time. But if that simply improves productivity, resulting in more consumption, then problem from an environmental standpoint doesn’t get solved. How do you conclude that by reducing production, consumption is increased? Why would it not just increase economy (greater efficiency) in the employment of labor and materials for instance? Can you walk me through this argument? It’s the Jevons effect. As production of a resource becomes more efficient the demand for that resource increases, which increases consumption of that resource and the related resources required for that consumption. The energy it takes overall to sustain the increased consumption eventually outpaces the original energy gains. This is what we’ve observed under capitalism so far. The problem today is that it appears the rate that capitalism reduces the capitalists relative to the proletariat is lower than the rate it consumes worldwide resources. OMG! You actually believe that rubbish? In that case, explain the book publishing industry. Since a book can be reproduced with no more than a right-click, demand for books must be approaching infinity, right? Oh, that’s right — Jevons mistook his limited extrapolation of the available data over a few decades with the whole trajectory of the capitalist mode of production. Sheesh. Look at the wider picture. The internet has increased it’s energy consumption. Look at how much energy Bitcoin miners use. It’s not debatable that capitalism is using more resources as it evolves, not less. A book is a resource. So here is a simple question: Why hasn’t the demand for books risen faster than productivity? Or is it your argument that this only applies to “energy”? As to capital using more resources, how would you know this is true? The state now absorbs 40-60 percent of most economies in the world market. The state is not a capital and does not function as a capital. This implies that capital, properly speaking, has not been growing as you assert. It is certainly true that the state has been using more resources, but capital has not. A book can be a resource in some context, but it’s produced from inputs such as materials, energy, and labour. As long as there is a demand for books they will continue to be produced until demand stops or resources become unavailable. All of it resolves to energy production/consumption, primarily fossil fuels. It’s capital’s absolute growth that matters. If the state is totally distinct from capital, then why not secure its position by eliminating wage labour? I have hundreds of book on my computer. None of them required any inputs. As to energy, there is no reason why its production requires fossil fuels. While the state is distinct from capital, it is dependent on the surplus value extracted from labor by capital. It can no more abolish wage labor than it can abolish itself. Of course your computer required inputs. Additionally, the information conveyed by the books required labor inputs, which in turn required material inputs. Assuming it runs off electricity supplied by the grid, it still requires inputs. We don’t need to use fossil fuels at the rate we do, but it would be a different society if it focused on human needs. For instance, we don’t need to use as much energy and land growing food the way we do, where approximately 80% of agricultural land provides only 20% calories and 30% protein, but this obvious waste of resources does not matter when profit is the purpose for growing food. Why do you emphasize the state’s role in energy consumption when it depends on capital? Because the state is the biggest single consumer of the surplus product of capital by far. Get rid of the state and you get rid of 40-60 percent of consumption of surplus value. Get rid of this consumption and the production of surplus value becomes untenable. The unproductive consumption of the state is the most important prop of the capitalist mode of production, but it can only be abolished if hours of labor are drastically reduced at the same time. If the state is a product of surplus value, then the capitalist mode of production props up the state. If you can somehow abolish the state and eliminate the consumption of 40-60% surplus value (or that portion of the state responsible for the consumption), then it seems there is still surplus value being produced: the other 40-60%. I think you mean reduce hours of labour to shrink the productive sector, thus shrinking the state. Right? You’re only looking at one side of the problem. Having produced the surplus value that is now being consumed by the state, capitals now have to convert this surplus value into money, to sell the product. Right now the state is absorbing all of this excess surplus value. If the state no longer does this, it will likely result in the loss of most, if not all, of the surplus value and the bankruptcy of the capitals involved. So the 40-60 percent figure represents the “excess” surplus value consumed by the state? If the state does not convert his excess surplus value into money, bankrupting the capitals involved, what happens to the other capitals not involved? Second, it should be clear that this is not a condition peculiar to one or another capital. I am speaking of absolute over-production of capital. This means the above condition is true for all employed capitals. An average rate of profit is distributed among all the employed capitals in proportion to their relative size. Likewise, absolute over-production of capital implies over-production against the total capital of society, not just individual capitals. All capital are involved in this. This sounds like the tendency for the rate of profit to fall, or the diminishing returns of additionally deployed capital. The capital still operates at a profit even if the rate of profit declines. Is this excess capital being absorbed partially, roughly 40-60 percent, by the state? Regarding my question about the state: in other words, I’m not convinced the state should not be considered a part of capitalist society. It’s a part of it as capitalist society evolves.